"Not ready for marriage, a fashion model moves into an unbelievably nice Brooklyn Heights apartment, where scary occurrences turn into a much more frightening turn of events." Since I've been completely addicted to my Roku box and watching scores of Netflix movies for the last few days, I've decided to start reviewing a few of the better ones that I've seen. Obviously, this time it's Michael Winner's "The Sentinel". I don't think I've rewatched "The Sentinel" since it was shown on Channel Four way back in the '80s and I didn't actually like it at the time due to having a totally irrational dislike of Burgess Meredith. There are just some actors and actresses who have me changing TV channels quicker than green grass through a goose and Burgess "The Penguin" Meredith is up there along with the Baldwins, Arquettes and Colin Farrell. Fortunately for me, Burgess Meredith doesn't spend nearly as long on screen in "The Sentinel" as the absolutely gorgeous Cristina Raines who I remember most from "Flamingo Road". Yes, I used to watch some pretty strange things when I was a kid. Anyway, "The Sentinel" is very much a "good vs. evil" movie in a similar vein to "Rosemary's Baby" but with far more diabolical goings on and an even more downbeat twist ending. The ending really is quite unexpected though I'm sure some people would say that they saw it coming from the beginning. I really didn't get into all the "Catholics versus The Devil" stuff otherwise I probably have picked up on what was really going on sooner but, honestly, I was just enjoying all the haunted house style shenanigans and bizarre characters to even guess at the bigger picture. The other thing which completely distracted me was the huge number of famous actors and actresses in "The Sentinel" who are known for much better roles. If you are anything like me, you'll find yourself asking, "Isn't that so-and-so?" quite often and, yes, it really is so-and-so too. Even what you might think are just cameos or bit parts actually contain some very well known actors indeed. What I really like about this film was that it had some genuinely creepy moments and stayed completely serious in places where it could have become somewhat ludicrous. If you are in the right frame of mind, however, you could probably also watch "The Sentinel" as a sick comedy in the way that some people now think of "The Exorcist". One major problem for a modern audience is that there are a lot of times when nothing scary happens at all and the pace of the movie drags. If you've watched a lot of TV horror movies from the '70s then you'll probably think you are watching another one rather than an actual theatrical release. Some of this is due to a quite superfluous subplot with cops played by Eli Wallach and Christopher Walken. I must admit that any '70s horror films that lazily throw a cop sublot into the mix really turn me off whether it's Christopher Walken as one of those cops or not. I won't say that "The Sentinel" is my favourite horror movie but I certainly wouldn't discount it as a legitimate entry into the genre. It has a couple of decent jump scares and some scenes near the end which exploit a load of physically deformed people in ways that even Tod Browning would be proud of. 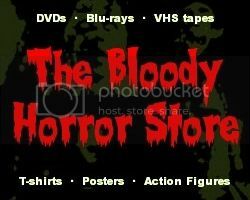 If you are a fan of '70s horror movies then you'll probably like this. It's not nearly as good as "The Omen" (1976) as a genuinely frightening Catholicism-based supernatural horror but it is still entertaining enough and has a few shocks if you haven't seen too many other horror films from this time. I rate "The Sentinel" as "Just Average".